The crew over at Focalpoint sent through their latest “Van Ventures” video from their weekend of riding street spots and skateparks down in Australia. As always, these are raw cuts giving you a look at the riding and good times that they had. This is loaded with some great clips that are worth a look, so get on that play button and take a peek! “This weeks Van Ventures featuring Alex Bolton, Jake Deering, Pat Freyne, Polly, Tasman Murray and Brad Anderson. The Focalpoint crew loaded up the van for another weekend of good times and spots! Here’s a look at what went down when the Focalpoint BMX crew down in Australia went out to cruise some spots last weekend! This raw cut gives you a look at the riding that went down and then some of the laughs that went down. Hit play and take it all in! Focalpoint just dropped a rad video from some time the crew got in at the Ringwood Skatepark! The crew at Focalpoint sent through this fresh edit featuring a bunch of familiar faces getting some riding time in at the Ringwood Skatepark in Melbourne. This plaza style park let to plenty of grinds and a little bowl action. Take a peek! Focalpoint have released the second round of Van Ventures footage! The Focalpoint BMX crew loaded up the van and ventured out into the streets to cruise spots and stack some clips. Here’s a look at what went down! Although this is a raw cut, there’s plenty of real solid riding worth checking out! Take a peek! “Another weekend packed full of fun. Ricky Catanzariti was over from Adelaide so the good vibes were flowing. Clips from Ricky Catanzariti, Tasman Murray, Jax Anderson, Pat Freyne, Jake Deering, Polly, Alex Bolton & Sean Falkenstein. Focalpoint coming through with the outtakes to Pat Freyne‘s section from the “Alive & Well” video. If you caught Pat’s section earlier this week, you know that he threw down and stacked some amazing clips, but he had his fair share of crashes that he had to fight with while putting in that work. Here’s a look at what didn’t make its way into his part. We’re just stoked he rocks a helmet full time. Big props for that. Did you miss Pat’s section? Watch it here: Focalpoint – Pat Freyne “Alive & Well” Section! It’s that time of the week again for Focalpoint to to upload a section from their “Alive & Well” DVD online for your viewing pleasure. This time around we get Pat Freyne‘s section that’s packed full of street destruction. Pat is a grinding machine and is not scared to send a tailwhip, barspin or a steezy toboggan out of a grind on a big rail. Check out all this goodness! “Pat Freyne’s section from the Alive & Well DVD put out by Focalpoint. The 2nd last part from the DVD and it’s heavy! Let’s talk about the “Alive & Well” DVD from Focalpoint! If there is one guy who we don’t quite know how he manages to do everything he does, it’s Cooper Brownlee. Between his roles with Colony and Division Brand, he has always managed to put a lot of time into keeping Focalpoint going strong, keeping the scene down in Australia rolling along. A few weeks back, the latest full-length video from Cooper and Focalpoint called “Alive & Well” was released and it’s a banger of a BMX video packed full of familiar faces. 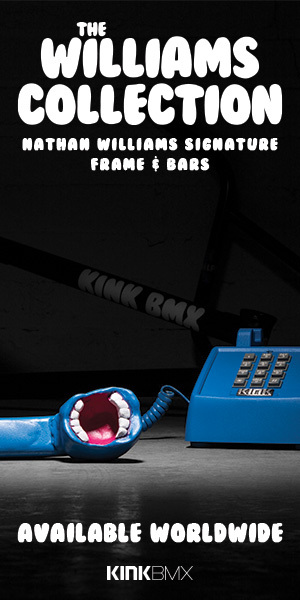 The video features full parts from Jake Deering, Sean Falkenstein, Alex Bolton, Kym Grosser, Pat Freyne and Jack Kelly, with mixes and a split section featuring Marius Dietsche, James Pease, Cooper Brownlee, Polly, Brad Anderson, Chris Whyte, Daniel Johnson, Jack O’Reilly, Jacman Hinss, Lachy Swanton, Tasman Murray, Jax Anderson, Chris Henderson, Kyle Fletcher, Matt Green, Jack Gruber and Alex Hiam. If you aren’t going through that list and wanting to see this video already, you’re crazy because that’s some of Australia’s finest that all stacked clips for this BMX video. Going into the video, we had a pretty good idea of what we were getting into. We’ve followed Cooper’s videos enough over the years to know that we’re going to get some really clean film work and pretty straight forward editing without a lot of extra fluff or graphics. We’re big fans of clean and simple, and that’s exactly what we got in this video. The film work had a good mix of long lens and fisheye shots without over doing it with the second angles for clips unless it was necessary. The video has a good balance for the footage and it makes it easy to watch without getting caught up thinking about how they could have done this or that to make it better. When it came to the music, the “Alive & Well” video focused more on classic and laid back tunes from bands like Blood Ceremony, Sacri Monti, Uriah Heep, Blues Pills, Leon Russell, UFO, Electic Citizen, Omega and Mott The Hoople. We really liked the sound track for this since you can’t go wrong with the classics. If you like rap with your videos, you’re not getting much love in this one. The “Alive & Well” video is all focused on the streets with a lot of rail and ledge destruction, ditches, banks and wallrides. There might be a skatepark clip or two mixed in there, but this is for the most part just grinds and lines. With a line up like the one this video has, you get a lot of different tricks and a good mix of styles in this, which helps keep things interesting from start to finish! Overall, the “Alive & Well” video turned out just as dialed as I had expected when I saw the trailer for the first time. We were really stoked on the whole video, but Jack Kelly didn’t disappoint with the ender! The entire video runs a total of 54 minutes including the crash section that is packed with heavy slams and some good laughs, so it’s a decent length! It’s actually a lot of video for the price, since it is currently available for FREE with any order from the Focalpoint Webstore! Talk about a deal. Check out the trailer below and you can learn more about the video over on the Focalpoint website! Here’s some awesome news that you sould be stoked on. Focalpoint just dropped this trailer for their “Alive & Well” DVD that is dropping later this month! Based off the trailer, it’s safe to say these guys put in some serious work for this video and definitely had their asses kicked a bit in the process. This video features a ton of Australia’s finest with Cooper Brownlee behind the lens, so you know it’s going to be a real good watch. Get the full details on the video below! “I’m so excited for this trailer to be out. I can’t thank all the guys involved in this project enough, they really went above and beyond and I feel it will show in the riding when the dvd drops. For now though you get to see 6 months of filming crammed into 3 minutes. The DVD will feature full sections from Jake Deering, Sean Falkenstein, Alex Bolton, Kym Grosser, Pat Freyne and Jack Kelly along with a stack of clips from more crew. We are having 2 DVD premiere’s for this project. The first being at ACT jam (Thanks to Backbone) at the after party on Monday night (April 24th). Then we will be having another premiere in Melbourne on May 5th at Revolver. More details to follow. The DVD itself will be free and you have 2 ways of getting it… You can pre-order it here and we will post you out a copy on May 5th for just the cost of postage ($5 anywhere in the world). Or, from today, all apparel orders from the online store will receive a free copy in their orders. Note: Your apparel order will ship straight away, we will send you the dvd on May 5th.